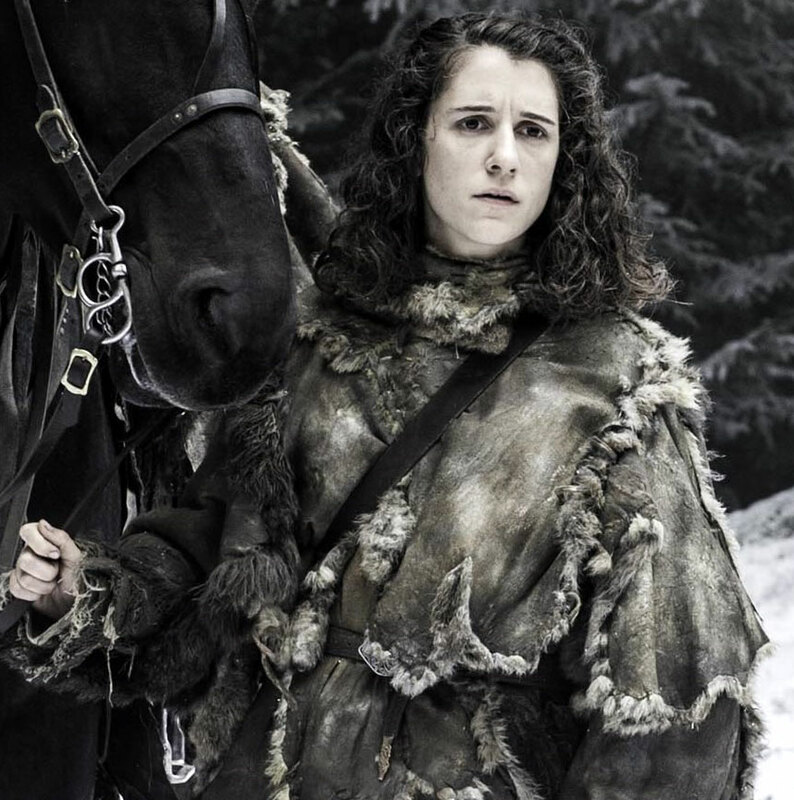 Of course, with so many plot-threads to service, the show couldn’t spend as much time with ‘Meera’ (Ellie Kendrick) as I might have liked*, but she did participate in a couple sequences which should live long in the memory of GoT fans. In ep #6.5 she successfully snuffed a White Walker (with a dragon-glass spear), making her only the third character to do so, so far… and the first of the female gender! Though they’d wisely decided to start wearing armour since their run-in with ‘Jon Snow’ (Kit Harington) at Hardhome, Meera was an experienced huntress, and had the good sense to aim for its exposed neck, which she struck with expert precision… so major snaps to her for that! Sadly there were plenty more Walkers where that one came from, and so our heroine found herself in the unenviable position of trying to rouse ‘Bran Stark’ (Isaac Hempstead-Wright), who was lost in a flashback vision, in the hope that he could warg ‘Hodor’ (Kristian Nairn) into action against the undead invaders… resulting in a decade-spanning snafu that melted the selfless servant’s brain in the past, imprinting it with his habitual catchphrase (and subsequent nickname), which was revealed to be a corruption of Meera’s insistent cries for him to “Hold the door!” that was keeping the swarm of snow-zombies contained. It was a truly heart-breaking scene, that’s still making me a little teary as I type this description, and retroactively reveals just how noble poor Hodor was, as he’s been working tirelessly to protect his young master all this while, despite the devastating toll it would take (and had taken) on his life. Bless. He also (most likely) died saving Meera’s life, and ensuring that Ellie would be back again next season, which makes him a saint in my book! The next time we caught up with his fleeing wards, Meera had exhausted herself dragging Bran’s unconscious body through the woods, and was looking like a goner as the Wights closed in around them… until the boy’s undead uncle ‘Benjen’ (Joseph Mawle) rode to the rescue with a hella-cool flaming flail! Hurrah! Personally, I still don’t understand how Meera and Bran got over (under?) The Ice Wall in the first place, but now it looks as if they’re heading back towards Winterfell, so that the super-powered Stark clan can re-assemble and prepare for the wars to come… I just hope Meera has time to enjoy a nice egg-and-bacon sarnie before going into battle again. She’s definitely earned it! 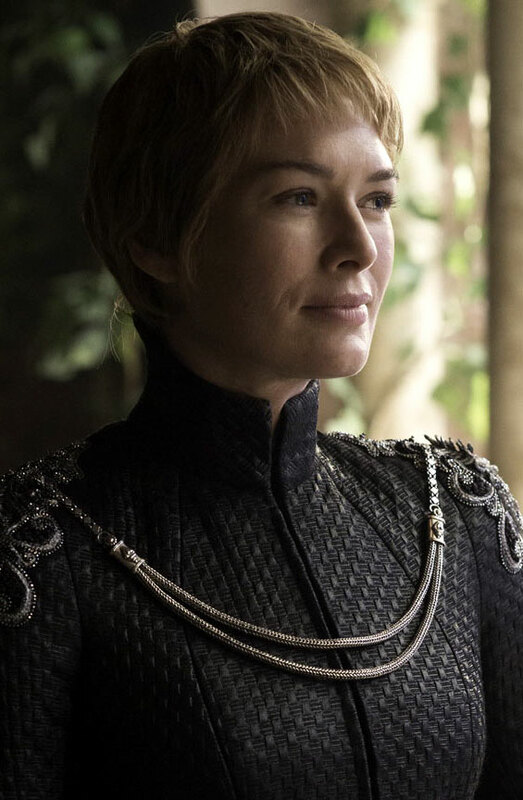 In sunnier climes down south, ‘Cersei’ (Lena Headey) once again demonstrated that her insufferable smugness is in direct proportion to the shitness of her strategies, as she opted to press the (metaphorical) Big Green Button and raze the Great Sept of Baelor with wildfire, rather than face another trial at the hands of the jumped-up ‘High Sparrow’ (Jonathan Pryce). 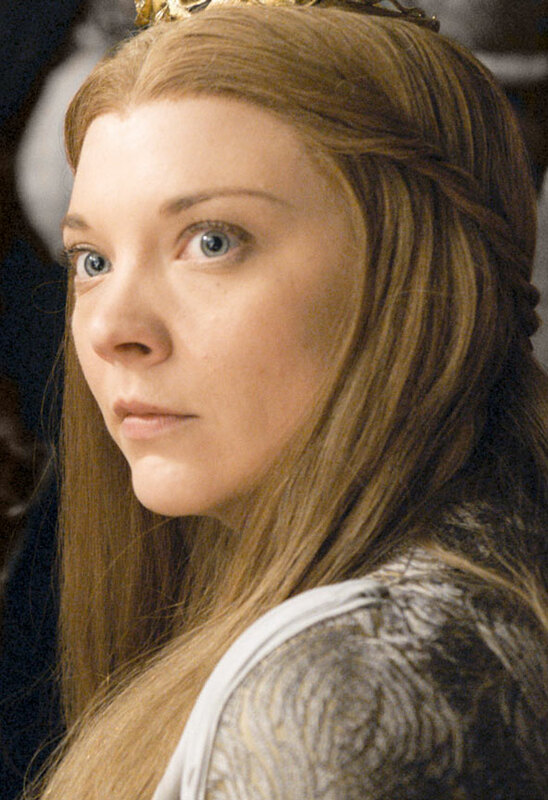 Sadly, the blast also took out master-manipulator (and captive Queen) ‘Margaery’ (Natalie Dormer) and her broken brother ‘Ser Loras’ (Finn Jones), along with numerous innocent bystanders, and not-so-innocent zealots. Having been confined to his quarters, where he watched the devastation from a safe distance, King ‘Tommen’ (Dean-Charles Chapman) was so shocked by what his mother had done, he leapt from the window to his death. Harsh. Despite his untimely demise being prophesied by a fortune-teller back in the day, it’s worth noting that his suicide could possibly have been prevented if Cersei had bothered to explain herself beforehand, or comfort her son in the aftermath, rather than ogle the explosion from her own window, and then saunter down to the dungeons to mock and marinade ‘Septa Unella’ (Hannah Waddingham), before siccing the monstrous ‘Ser Gregor’ (Hafþór Júlíus Björnsson) on her. Feh! Of course, the insanely short-sighted Cersei still believes that she has “won”, as she settles her unworthy arse on The Iron Throne… but at this point she’s “Queen” of precisely sod all, with no children to marry off, no money in the bank, few-if-any loyal allies outside the capital, and a slew of wrathful rivals slowly surrounding her, with much stronger armies/navies, and working brains in their heads. D’OH!!! Although I’m sad to see Margaery/Dormer depart (unlike some characters, her death was pretty unambiguous here! 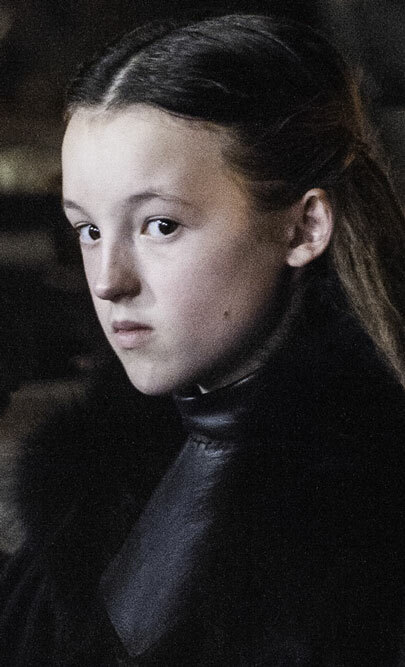 ), this season also saw the scene-stealing debut of a new favourite: ‘Lady Lyanna Mormont’ (Bella Ramsey), a bold-beyond-her-years tyke who managed to shame a room full of hardened male war-veterans into renewing their vows to fight under the Stark banner, by battering them with her blunt speech and steely will. She’s an absolutely awesome character, and Ramsey gave a remarkably assured performance in her two stand-out scenes here… so I was surprised to discover that this was the actress’s first ever on-screen appearance! There’s an interesting interview with her over on the Making Game of Thrones website… and concerned parents will be relieved to know that she was only shown a few select snippets from previous seasons, to help her prepare for the role. Phew! Aside from that, I also thought Samantha Spiro did a lovely job as Samwell’s sweet and sympathetic mother, ‘Lady Melessa Tarly’… but now that her son has high-tailed it from the family home again, I assume that’s the last we’ll be seeing of her…? As for my fave male characters, I was very happy to see that “The Hound” (Rory McCann) had managed to heal-up and restore his strength since Arya left him for dead back in the Season Four finale… and I admired his candour when it came to admitting that he’d been beaten by “girls”. Despite evidence of a softer heart beating beneath his gruff exterior, it remains to be seen if he’ll chose to become a (cynical/snarky) force for good now that he’s re-friended the “Brotherhood Without Banners”, or simply go back to fighting for his own selfish survival again. I know there are still plenty fans hoping to see him face-off against his sadistic brother Gregor, in what they’ve dubbed the “CleganeBowl” tourney… but I wouldn’t be in any hurry to go mano-a-mano with “The Mountain”, if I were him! Meanwhile, ‘Tyrion’ (Peter Dinklage) had a relatively low-key season, with several slightly clumsy “comedy” scenes, but I did love his intrepid expedition into the dark dungeon to free Dany’s safely-shackled dragons from their miserable captivity. A potentially deadly gamble on his part, but one that paid hefty dividends for Meereen and viewers alike! * Which would be an infinite amount of time, obviously. This entry was posted in Rants about TV and tagged Bella Ramsey, Benjen Stark, Bran Stark, Cersei Lannister, Dean-Charles Chapman, Ellie Kendrick, Finn Jones, Game of Thrones, Gregor Clegane, Hafþór Júlíus Björnsson, Hannah Waddingham, High Sparrow, Hodor, Isaac Hempstead-Wright, Jon Snow, Jonathan Pryce, Joseph Mawle, Kit Harington, Kristian Nairn, Lena Headey, Loras Tyrell, Lyanna Mormont, Margaery Tyrell, Meera Reed, Natalie Dormer, Peter Dinklage, Rory McCann, Samantha Spiro, Sandor Clegane, Septa Unella, Tommen Baratheon, Tyrion Lannister. Bookmark the permalink.